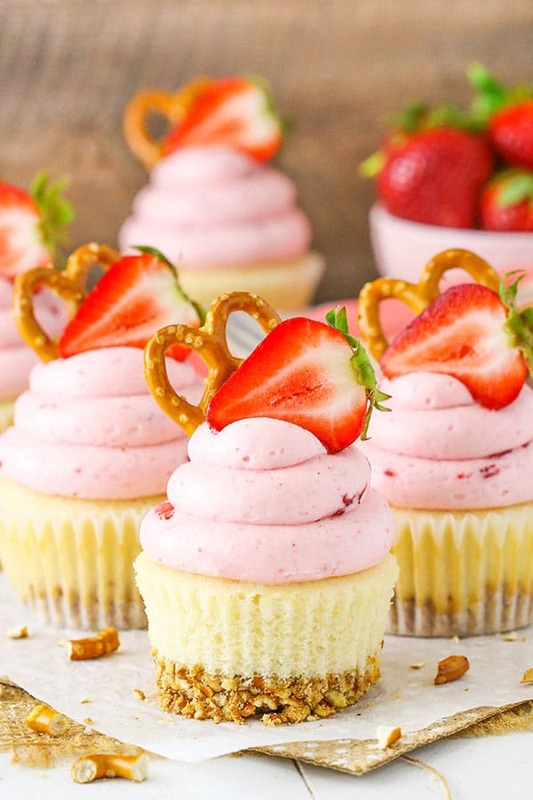 These Strawberry Pretzel Salad Cupcakes are made with a pretzel crust, vanilla cupcake, cream filling and strawberry frosting! 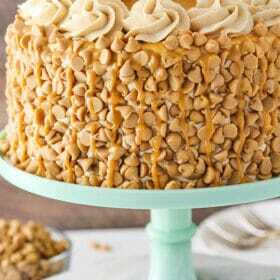 They’re inspired by the classic dessert and so fun! So I’ve seen strawberry pretzel salad recipes around for a while now. I can’t say that it really appealed to me as something to try. I’m not entirely sure why, but it just didn’t. I was curious about it, but not curious enough to make it. Well as luck would have it, we were at a friend’s house for Easter and it’s one of the things they served. I was excited to finally get to try it. I was pleasantly surprised too! SO good! I guess I shouldn’t be that surprised. I do love a good sweet and salty treat. But the combination of pretzel, cream and strawberries and jello was even better than I thought it might be. The hubs had several helpings. So naturally I wanted to make a dessert inspired by the classic. It took a while to decide exactly how I wanted to execute it and it took even longer to get the frosting just right, but I’m so pleased with how they turned out. And our hosts from Easter got to try them and they got a big fat stamp of approval! So to start, there’s the pretzel crust. That’s kind of a no brainer. Just be aware that like the classic dessert, a pretzel crust doesn’t hold together as well as a graham cracker crust. Try to grind the pretzels into somewhat fine crumbs so that they hold together better. I used my food processor and while they were a bit crumb-y, they held together pretty well. Next up was the cupcake. I toyed with making it strawberry but went with vanilla. With the middle layer of the classic dessert being vanilla/cream, it seemed most appropriate. To further the cream filling layer, there’s a cream filling in the cupcake. It’s made with cream cheese, just like the classic, and it’s light and yummy! Topping the cupcake is the strawberry frosting. Since the classic dessert uses strawberry JELLO, I felt it only appropriate that the frosting did too. And then of course, fresh chopped strawberries. I initially wanted to use a cream cheese frosting, but it didn’t end up being the best idea. Cream cheese frosting tends to be softer and with the fresh strawberries mixed in (which adds more moisture), it just didn’t hold it’s place on top of the cupcakes well. So I went with a more standard buttercream. To add the JELLO, I dissolved a little strawberry jello powder in some hot water and added that to the frosting. I tested it with both the original JELLO and their new Simply JELLO. I have to say I much preferred the Simply JELLO. It dissolved better in the hot water, which in turn resulted in a better frosting. If the powder doesn’t dissolve well, you end up with a grainy frosting and nobody wants that. I also preferred the more natural strawberry flavor and color. When adding the strawberry JELLO water to the frosting, be sure not to add too much. 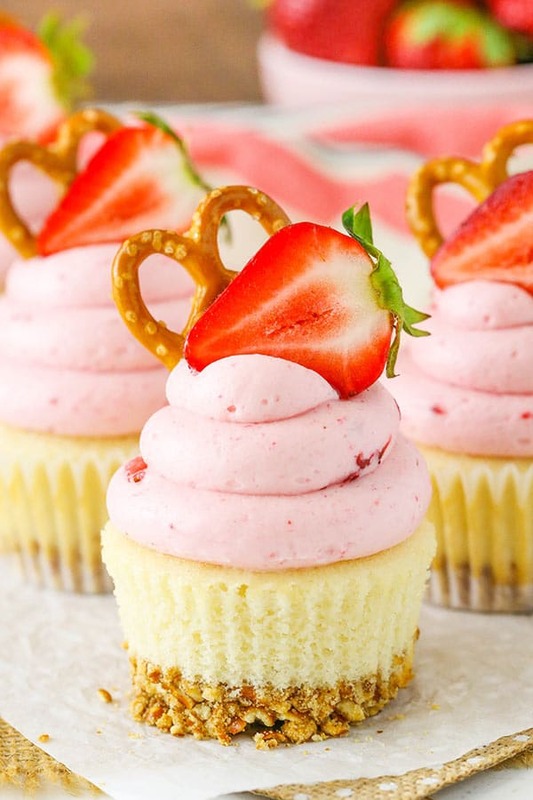 You’ll add the chopped strawberries next and they’ll add even more moisture to the frosting. You don’t want it to get too thin. 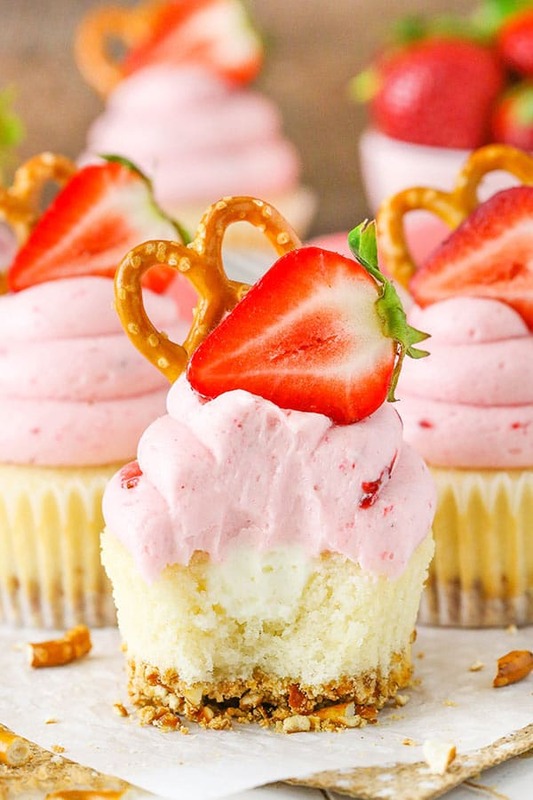 These Strawberry Pretzel Salad Cupcakes are made with pretzel crust, vanilla cupcakes, cream filling & strawberry frosting! 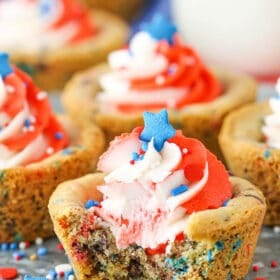 Such a fun cupcake recipe! 1. Heat oven to 325°F (162°C) and prepare a cupcake pan with liners. 11. Fill the cupcake liners with the baked crusts about three quarters full with batter. Bake for 14-16 minutes, or until a toothpick inserted comes out with a few crumbs. 13. To make the filling, add the heavy whipping cream and powdered sugar to a large mixer bowl. Whip on high speed until stiff peaks form. Set aside. 14. Add the cream cheese, vanilla extract and sugar to a mixer bowl and mix until smooth. 15. Fold the whipped cream into the cream cheese mixture in two batches. Set in the fridge. 16. To make the frosting, combine the butter and shortening in a large mixer bowl and mix until smooth. 17. Add 2 cups of powdered sugar and mix until smooth. 18. Add the JELLO powder to the hot water and stir until dissolved. 19. Add 1 tablespoon of the JELLO mixture to the frosting and mix until smooth. 21. Add remaining JELLO mixture as needed and mix until smooth. 22. Mix in the diced strawberries. 23. Use a cupcake corer to remove the centers of the cupcakes, then fill with the filling. 24. Pipe the frosting onto the cupcakes. I used Ateco tip 808. 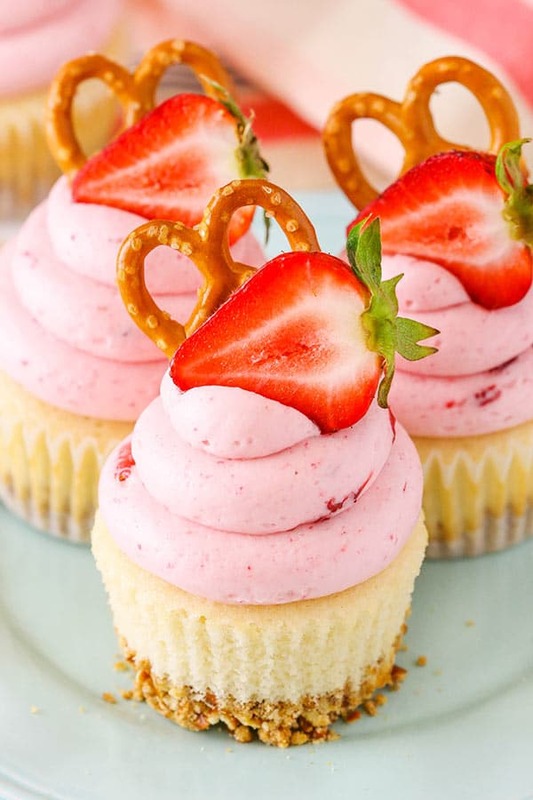 Top the cupcakes with a strawberry half and pretzel if desired. 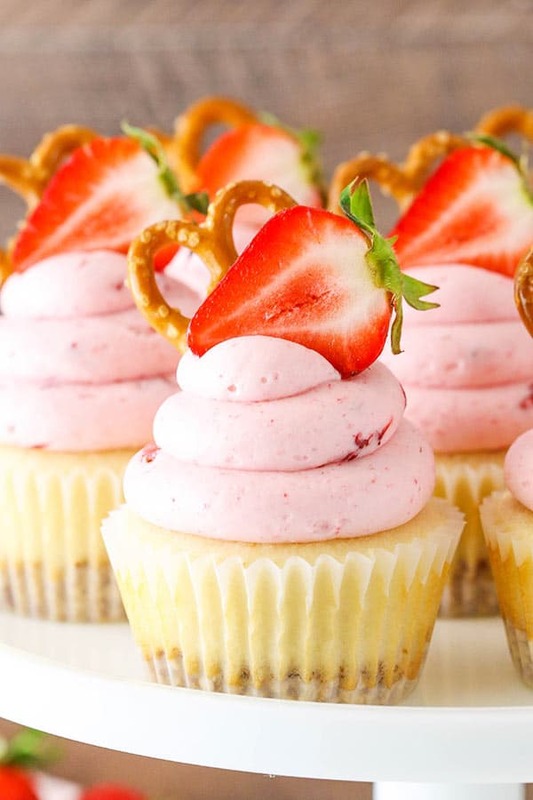 I am a little confuse on how to make this Strawberry Pretzel Salad Cupcakes. After baking the crust for 7 minutes, I let it cool down. Do I pour the batter on top of this crust to bake or do I bake the batter in a new cupcake liners? Please reply. Thank you. You want to pour the batter on top of the crust and then bake them together. 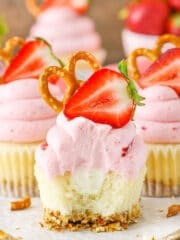 Strawberry pretzel salad is a favorite of mine, and these cupcakes look like a fun twist! Yummy! How do they hold up if not serving them for a few days? Can they be frozen? Thanks for the recipe! When I made these, the pretzel bottoms fell apart into a crumbly mess when the liners were taken off. Any tips on this not happening in the future? I packed them in tightly and used a food processor to crumble them. Hmm, I assume you pre-baked the crusts with the butter, right? That should help them hold together. You could try adding a little more butter or crushing up the pretzels a little more. The finer they are, they better they’ll hold together. Do these need to be refrigerated due to the cream cheese filling? Yes, I’d suggest refrigerating because of the filling. I just tried this recipe. I baked them for 14 mins. and the toothpick came out clean. when I scooped the cakes out to fill them I discovered the cakes were pretty raw. I’m thinking about trying to execute these as a layer cake. Do you think the filling and icing would be stable enough for that? 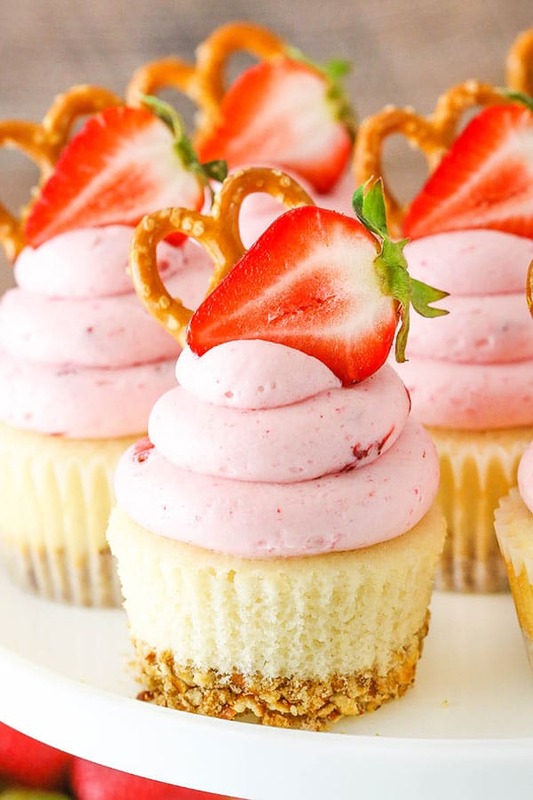 I’m thinking 3-layers of white cake, baking the pretzels for a bit into a crumble to put between the layers with the strawberry frosting, and icing the outside with your mascarpone icing. Does this sound feasible/delicious or am I being too ambitious? Well, that’s a bummer! 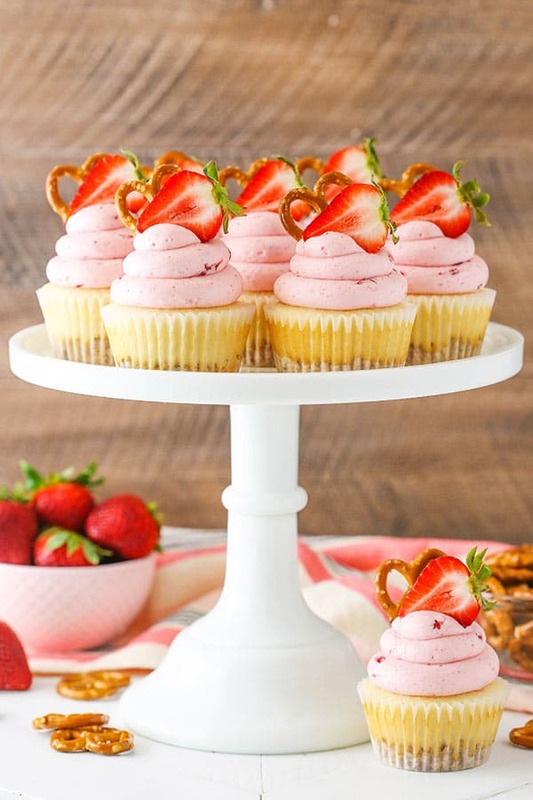 I’d probably try using freeze dried strawberries for the frosting, similar to how I did in this cupcake.